We’re all a little sore around the office today. But, while our muscles may be tired, there are smiles on our faces because of the great work we completed yesterday in our community. Early Tuesday, we donned our bright green shirts, grabbed our shovels, rakes and paintbrushes, and spent the day beautifying Observatory Hill for our Fifth Annual volunteer day. Thanks to the City of Pittsburgh’s ServePGH program, Observatory Hill, Inc., received a $1,000 Love Your Block grant to help PG purchase the supplies we needed to make the project a success. 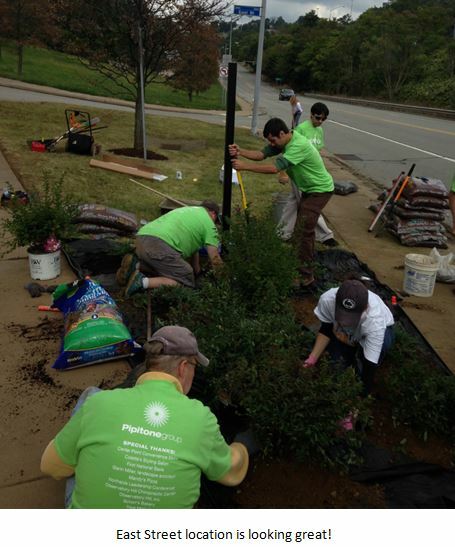 We also had detailed landscape plans in hand, thanks to the pro bono work of Glenn Miller, landscape architect and President of Observatory Hill, Inc.
We split into three teams to tackle three different areas in the neighborhood. 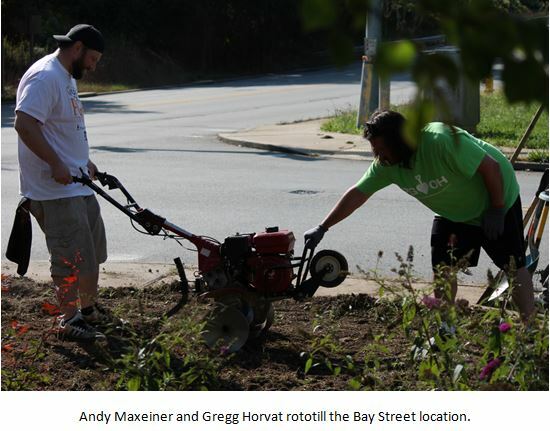 The Baytree Street team and the East Street team had similar tasks—beautifying green spaces. 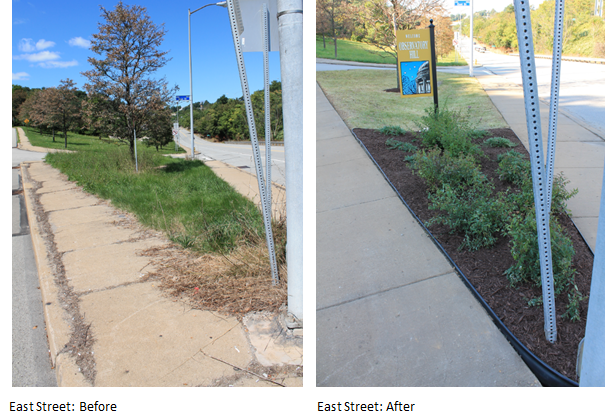 We pulled weeds, cut grass and rototilled and shoveled existing ground to make way for new shrubs and flowers and fresh mulch. The final touch for these projects were new “Welcome to Observatory Hill” signs we designed to greet visitors into the neighborhood and to remind them to drive safe as they leave. 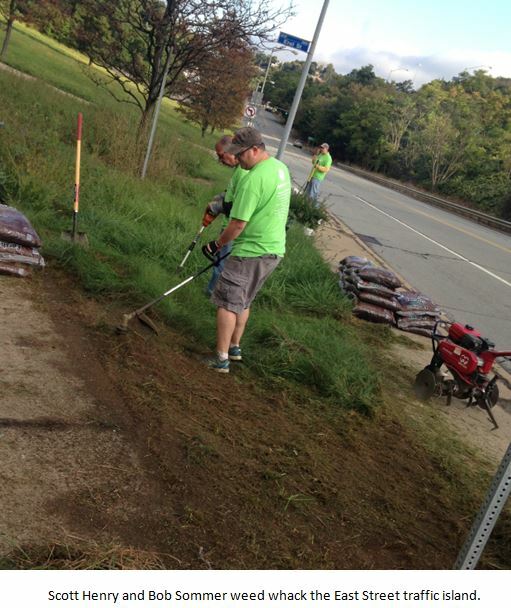 The third team worked on the 3900 block of Perrysville Avenue, just down from our offices. There we picked up trash, applied a fresh coat of paint to a neighboring building and installed storefront billboards designed to tell the history of the neighborhood. We enjoyed working together as a team outside of the office, proving to ourselves that we truly are an integrated team. However, perhaps the most rewarding part of the day were the reactions from people in the community. 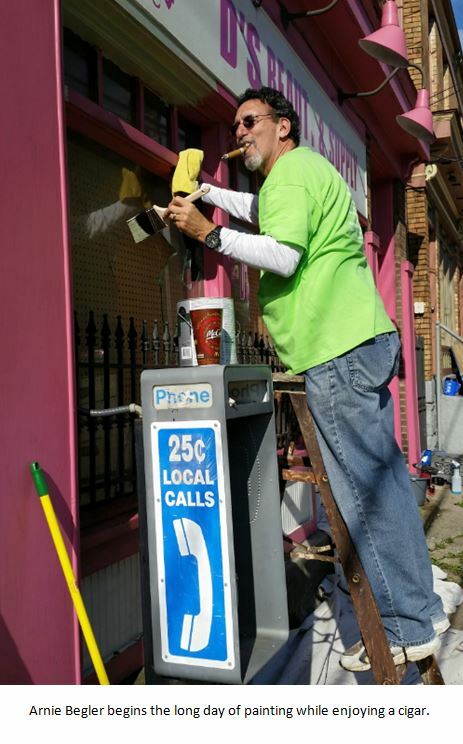 Dozens of citizens and business owners took the time to stop and thank Pipitone Group team members for their work. One local neighbor even donated cement and a mixing tray while he took great pleasure and pride in recording all our great work on video. This project truly was a community effort. 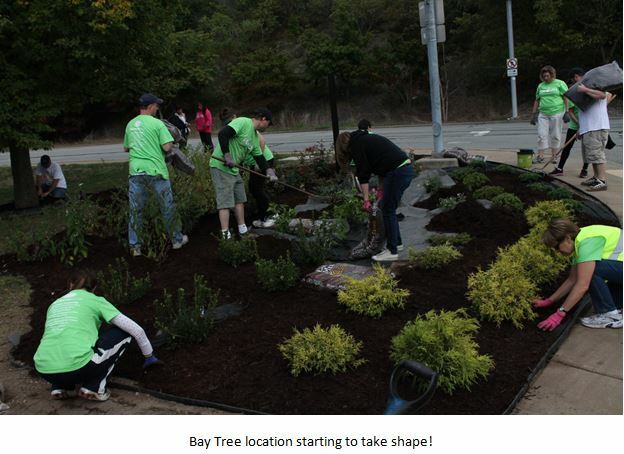 Not only did Pipitone Group rely on Glenn Miller for his designs and the City of Pittsburgh for its Love Your Block Grant, it took a team of businesses providing financial and in-kind sponsorship for the day: Center Point Convenience Store; Colette’s Styling Salon; First National Bank; Mandy’s Pizza; Northside Leadership Conference; Observatory Hill Chiropractic Center; Observatory Hill, Inc.; Schorr’s Bakery; and Trios Market. “Part of our mission statement is ‘doing great work with great people,’ and we were able to do just that with this project,” said Scott. 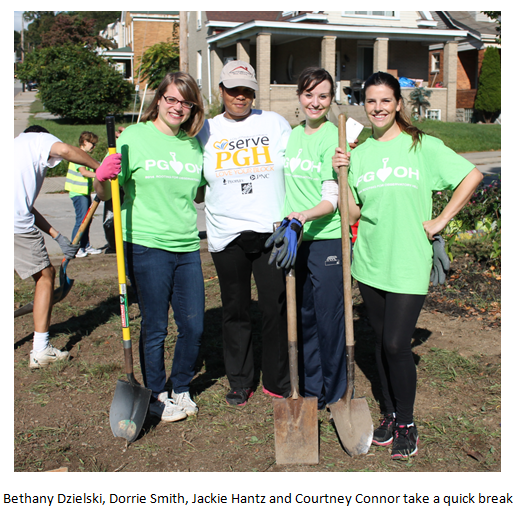 “It’s amazing to see how PG and the community really came together to make this all work,” said Pipitone. To see more photos check out our Facebook album below. Now it’s back to more Great Work, creatively collaborating with PG team members and clients on inteGREATed marketing and communications!